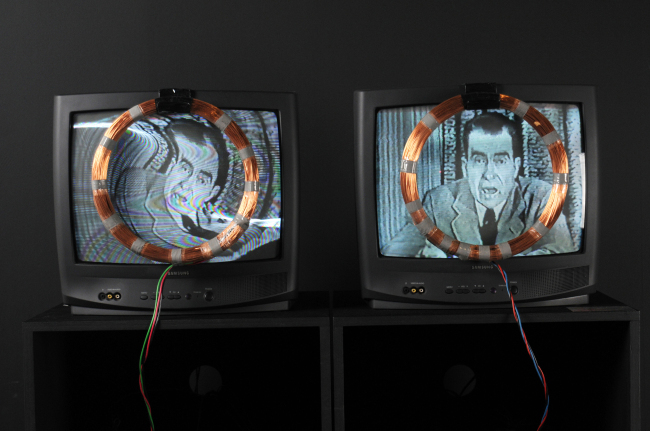 Nam June Paik, a pioneer of video art, is both famous and unknown to many in Korea. A query on the name “Nam June Paik” on Korean web portal Naver brings up several questions posted by young students asking who the artist is for their schoolwork. “My son, who is a first-year middle school student, doesn’t really know much about him either,” said Kim Bang-eun, president of Gallery Yeh, currently hosting the Nam June Paik exhibition at Seoul’s landmark Dongdaemun Design Plaza. “I think it’s because there haven’t been many shows where people could see his masterpieces,” she said at the exhibition opening last week. Despite frequent anniversary exhibitions that mark the death and birth of the pioneer of video art each year at major museums and galleries, Nam June Paik is still an unfamiliar name especially for young people today. The “Paik Nam June Show” at DDP attempts to bridge the gap between the late video artist and young visitors with impressive large-scale video art installations accompanied by dynamic sound and graphic media performances. Remarks Paik made in his lifetime are written in bold black font against the yellow walls of the exhibition space, making such words as “there is no rewind button for life” instantly Instagram-able. The highlight of the show is Paik’s 1993 work “Turtle,” which consists of 166 TV monitors forming a giant turtle. The monumental work is part of Paik’s hero series honoring historical figures such as Genghis Khan and Alexander the Great. The “Turtle” was made in admiration of the Joseon era’s Admiral Yi Sun-shin and his valiant fight against a Japanese invasion in the 16th century using the turtle-shaped battleship. 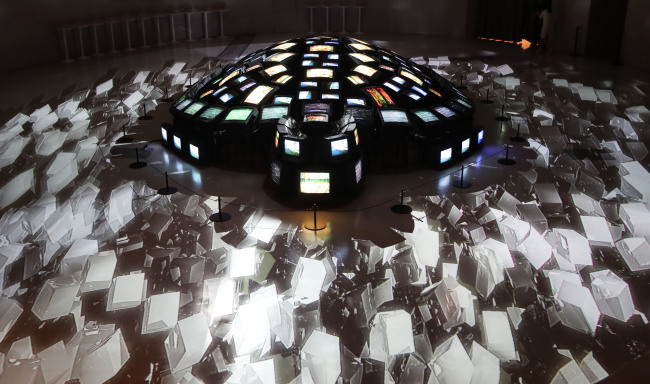 The show presents other large-scale video installations as well, including the 1991 work “M200” with 86 TV monitors that Paik created to commemorate the 200th anniversary of Mozart’s death. Additional visual and sound effects by contemporary artists intensify the impact of Paik’s video installations on viewers. In the section themed “love,” Paik’s chandelier video installations are surrounded by a romantic ambience created by media artist Choi Jong-beom’s soothing and sparkling visual and sound effects. Paik’s visionary approach to video art that defied conventional boundaries of art has inspired subsequent generations of artists to adopt various forms of technology and media in their art. Commemorating Paik’s far-reaching legacy, the Nam June Paik Art Center’s “New Gameplay” exhibition also introduces cutting-edge works of contemporary media artists who present interactive media works embedded with video game elements. The show presents 45 works by some 34 artists, game developers and labs, including the Los Angeles-based video game developer Thatgamecompany, artist Bill Viola and the Game Innovation Lab of the University of Southern California and the Karlsruhe Institute of Technology. Paik’s 1964 work “Zen for Film” is on view along with artist duo Jodi’s first-person shooter game without target objects. Media artist Bill Viola’s collaborative video game project with the Game Innovation Lab of the USC is also a first-person interactive game that guides players through a mystical and spiritual journey with the intention to lead players to enlightenment. The “Paik Nam June Show” runs until Oct. 30 at Dongdaemun Design Plaza. “New Gameplay” runs until Feb. 19 at Nam June Paik Art Center. For more information, visit www.ddp.or.kr or http://njp.ggcf.kr.